Since site plans have been submitted I guess it should have it's own thread. No renderings released yet. Ground level retail also!!!!! My mouth literally dropped for Still Golden, thank goodness it wasn't included. Jefferson Bank executives have purchased nearly an entire city block on Broadway across from the Pearl that was recently rezoned to allow for the construction of retail and high-rise offices. 1990 Broadway LLC, a company that Jefferson Bank President Paul McSween and three other executives formed earlier this month, purchased seven properties totaling nearly 1.7 acres last week at the northeast corner of Broadway and East Grayson Street, property records show. They comprise that entire block except for the building that houses the Still Golden Social House bar. The property purchased by Jefferson Bank’s executives is catty-corner from where local credit union Credit Human is building a 10-story, $112.5 million headquarters with the help of an $8.8 million incentive package from the city and county. The company plans to move 435 employees there from its current headquarters on the North Side and to hire another 50 workers. Isn't Jefferson Bank moving out of its headquarters building downtown in front of Travis Park?? Are they building a headquarters building at that site?? Please let it be 30 floors or greater. Jefferson Bank is indeed moving its headquarters to that lot. According to the link, they're targeting anywhere from 190K to 200K sq. ft. of office space. Frost Tower is roughly 460K sq. ft. of office. I think we'll be looking at something not much more than 10 floors. I'm fine with it not being more than 10 floors. I find it crazy this area is getting so dense. Will they be building a parking lot/garage on the property? If so, the square feet per floor could be substantially less than the Frost Tower to accommodate the parking. Assuming, of course, they don't build the parking lot/garage underground, under the building (above ground), or use a pre-existing parking structure. I'm also not entirely clear on the size of the property, so for all I know it could have much more space than I'm thinking. 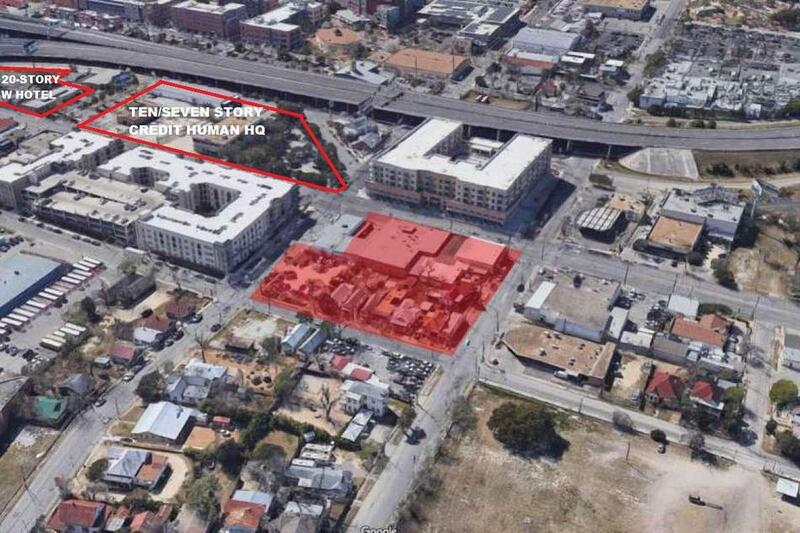 San Antonio: where density in the urban core is a bad thing. I never said that? I just it was crazy in a sense of, I wouldn't have guessed here in this spot on Broadway. Same, that place rules. Would have been pretty funny if they had been kicked out again for another office building lol. Jefferson Bank plans to build a 10-story office tower for its new headquarters on the booming Broadway corridor, plans filed with the city show. 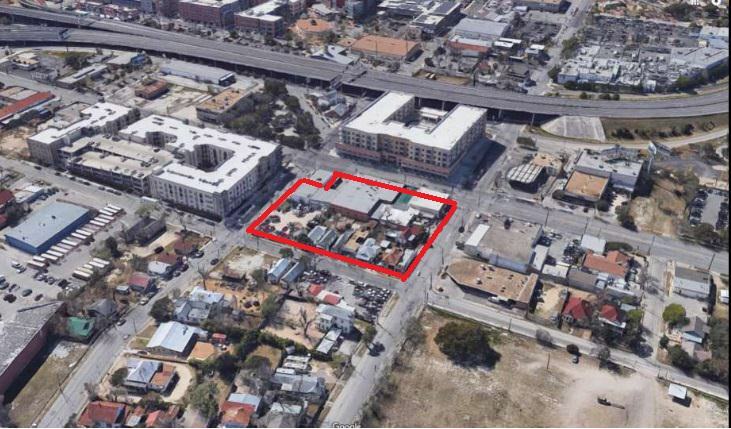 The local bank’s executives bought about 1.7 acres in June, taking up nearly the entire block northeast of Broadway and East Grayson Street — catty-corner to where a two-tower complex that will house San Antonio-based Credit Human’s headquarters and offices for Bank of America are being built. Jefferson Bank plans to build up to 200,000 square feet of office space along with some ground-floor retail at the site, President Paul McSween told the Express-News last year. The bank’s headquarters currently sits at Loop 410 near Harry Wurzbach Road on the city’s Northeast Side. 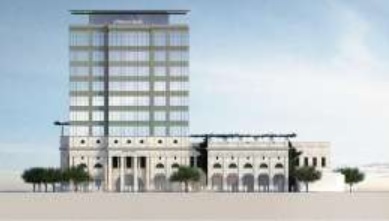 By: Joshua Fechter April 8, 2019 Updated: April 8, 2019 4:22 p.m.
Glad to see another high rise proposal in the news. That street level design is going to look so awesome. It's a great design. The tower will have 180,000 square feet of office space spanning seven floors, four levels of parking and ground-floor retail, said Plack Carr of Milam Real Estate Capital, the local firm developing the property. Milam plans to break ground on the tower by the end of the year and expects construction to last about 22 months, Carr said.